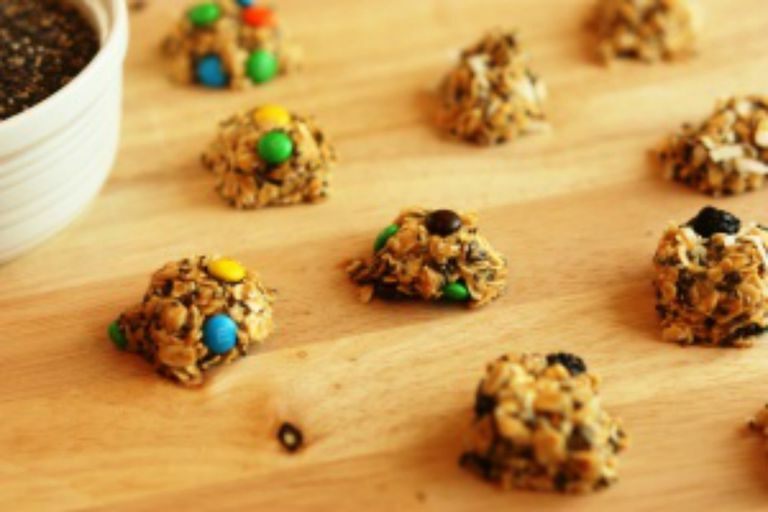 Finding a snack that rates as delicious among kids and nutritious among their parents can be a challenge, but this phenomenal and super quick and easy Chia Seed Energy Bites recipe is a pleaser for all. Every time we run out of this yummy snack, the kids want to know when I am going to make more. With no cooking required, it takes minimal time to whip these up to use as an after school snack. Or individually package them (my kids like three to a bag) to eat after soccer practice or wherever life takes you. What are chia seeds? They come from the desert plant Salvia hispanica, a member of the mint family. What awesome nutrition do they provide? One tablespoon of chia seeds contains 5 grams of fiber, 3 grams of protein, and omega-3 and omega-6 fatty acids. And they are so easy to add to food. My children like them sprinkled into their cereal, smoothie, and yogurt, and they are great mixed into oatmeal, so they can easily be eaten without much cooking or preparation. The recipe below is a base for other favorite additions, too. Nuts, dried fruit, chocolate chips, or coconut flakes can be added. We love to double the recipe and add a quarter cup chopped white chocolate chips and a couple of tablespoons of milled flax seed. And for an after school snack, we serve a few energy bites with fruit on the side. Readers commented that these are “delicious,” and another reader said, “My daughters love these.” Many readers loved finding a new way to use chia seeds, and to find a way to incorporate them in the diet that is easy, quick, and delicious is a definite win. In a bowl, combine ingredients together until well mixed.